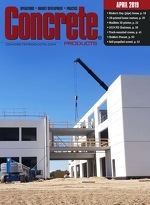 Pca: Will Epa Regs Foster ÀopecÌ Factor For Domestic Cement Consumers? A proposed hazardous air pollutant regulation for the cement industry undermines the balance between environmental protection and economic viability, potentially forcing U.S. concrete producers to turn to foreign powder sources, PCA noted at EPA hearings June 16-18 in Los Angeles, Dallas, and Arlington, Va.
Use of environmentally friendly concrete is one objective cited in a memorandum of understanding signed by the U.S. Environmental Protection Agency and the New Meadowlands Stadium Company, principal owner of the $1.3 billion NFL venue rising in East Rutherford, N.J. Though rain may delay a Baltimore Orioles game, the picnic area surrounding Oriole Park at Camden Yards can accommodate play even during wet weather. SAMUEL STRAPPING Company manufactures and supplies a range of steel and plastic strapping, hand tools, edge protection, stretch film equipment, and consumables. If popular trends often are viewed as a new wave, Building Information Modeling (BIM) in the construction industry can be considered an imminent tsunami. Increasingly stringent environmental regulations and an intensifying movement have generated interest in permeable interlocking concrete pavements (PICP). Safety @ 360?SM Initiative Oshkosh introduces an advanced 3-part Side Roll Protection safety system on the S-Series? front discharge mixer. View video. Advanced Concrete Technologies is a single source supplier of turnkey concrete mixing and batching systems. View video. Hanson Structural Precast announced in late April the purchase of Cheyenne Concrete Co. and its Eagle Precast Co. and Alpine Crane & Rigging subsidiaries. L.B. Foster Co. Chairman Lee Foster II, CEO Stan Hasselbusch, and other executives presided over formal closing of May 7 trading on the Nasdaq stock exchange.